Check the symptom from the customer's information. Check that any symptom occurs other than the interviewed symptom. Noise >> GO TO 7. Perform the system diagnosis for the A/C control system. Is A/C control system normal? YES >> GO TO 4. Perform the performance test. Check the operation of each part. Refer to HA-26, "Inspection". Diagnose using a manifold gauge whenever system's high and/or low side pressure(s) is/are unusual. Specify the malfunctioning part. Refer to HA-28, "Symptom Table". Low refrigerant charge>>GO TO 6. Check refrigerant for leakages. Specify the malfunctioning part. Refer to HA-19, "Leak Test". Perform trouble diagnosis for noise. Specify the malfunctioning part. 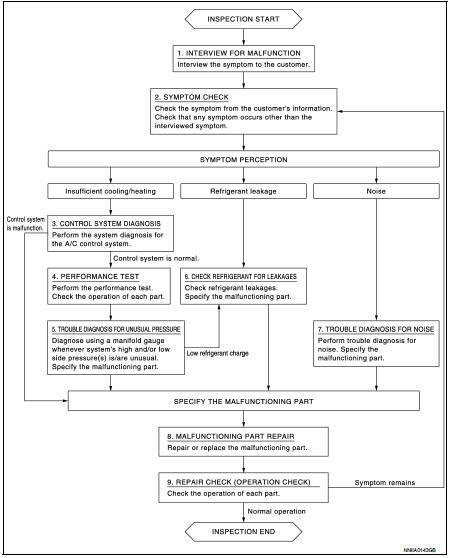 Refer to HA-28, "Symptom Table". Check the operation of each part.